A worker cuts steel in Qingdao in China's eastern Shandong province. President Trump said Thursday that he plans to impose tariffs on U.S. imports of steel and aluminum. President Trump promised steel and aluminum executives Thursday that he will levy tariffs on imports of their products in coming weeks. He said the imported steel will face tariffs of 25 percent, while aluminum will face tariffs of 10 percent. "We're going to build our steel industry back and we're going to build our aluminum industry back," Trump told reporters. The president announced the action after meeting with leaders of the two industries at the White House. On Thursday afternoon, major stock market indexes fell sharply after Trump's announcement, with the Dow Jones industrial average closing down 420 points, or about 1.7 percent. The decision follows a study by the Commerce Department that found that large amounts of steel and aluminum imports posed a threat to U.S. national security. That finding gives the White House the authority to limit imports by tariffs or other means. Earlier Thursday, Trump tweeted: "Our Steel and Aluminum industries (and many others) have been decimated by decades of unfair trade and bad policy with countries from around the world. We must not let our country, companies and workers be taken advantage of any longer. We want free, fair and SMART TRADE!" U.S. Steel CEO David Burritt, one of the industry executives who met with Trump, said, "We are not protectionists. We want a level playing field. It's for our employees; to support our customers. And when we get this right, it will be great for the United States of America." John Lapides, president of United Aluminum Corp., said unfair competition has hurt investment in his business "and that lack of investment is reflected in a loss of jobs in America. ... And we need a level playing field, or we're going to lose our manufacturing infrastructure and the national security issues that surround having a vibrant, capable manufacturing sector." Chad Bown, an economist and trade specialist, says the tariffs will drive up the price of steel and aluminum for the multiple other industries that use the metals. Those industries actually employ more people than the steel and aluminum sectors, he says, "so this is a really big concern, just from an economic perspective." 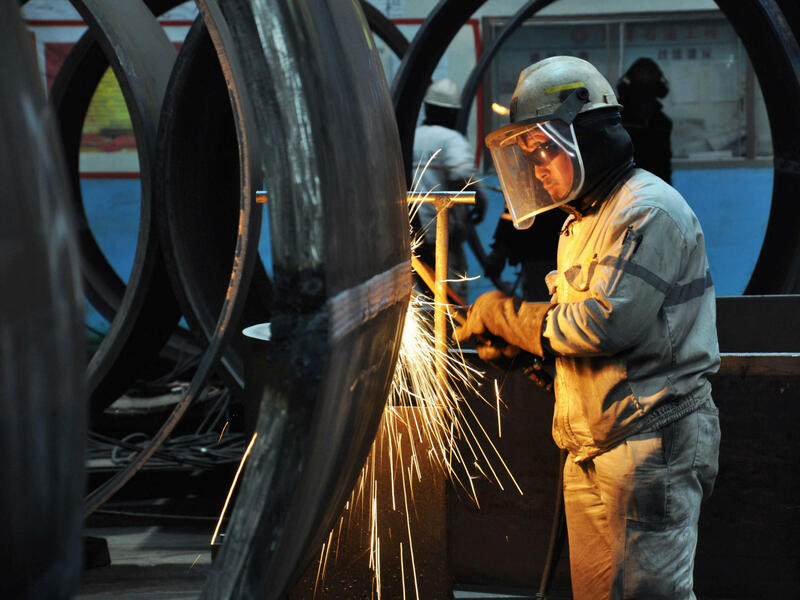 The tariffs are a response to the overproduction of steel and aluminum by China. But since there are already import restrictions on those Chinese products, new barriers are likely to have an impact on European allies, as well as Canada and Mexico, which could trigger retaliation. As NPR's Scott Horsley reported, the Commerce Department argues that growing imports of steel and aluminum, driven in part by overproduction in China, have so weakened America's producers that a future military mobilization could be at risk. Canada is the largest supplier of both products to the U.S. It's responsible for more than half of U.S. aluminum imports and about 17 percent of steel imports. Given the national security basis for the tariffs, it's ironic that under U.S. law, Canada is actually considered a part of the U.S. defense industrial base. Canada's trade minister called the U.S. tariffs, which will take effect in two weeks, unacceptable. China has threatened to retaliate by curbing imports of U.S. soybeans. The European Union says it is considering action as well. Commerce Secretary Wilbur Ross recommended a tariff of at least 24 percent on steel imported from any country and a tariff of at least 7.7 percent on aluminum imported from any country. Ross offered another set of options that would have set a tariff of at least 53 percent on steel from 12 countries including Brazil, China and Russia and a tariff of at least 23.6 percent on aluminum from China, Hong Kong, Russia, Venezuela and Vietnam. Companies that use a lot of aluminum and steel are concerned their costs will soon go up. President Trump today announced stiff tariffs on imports of those materials. PRESIDENT DONALD TRUMP: It'll be 25 percent for steel. It'll be 10 percent for aluminum. SHAPIRO: Trump made that announcement as he wound up a meeting with U.S. steel and aluminum executives at the White House. As NPR's John Ydstie reports, the move could benefit those industries but hurt the broader economy. JOHN YDSTIE, BYLINE: U.S. steel and aluminum companies have long sought protection from imports. They've complained that overproduction in China has driven down global prices and hurt U.S. competitiveness. Today the U.S. industries got some relief from a president who had promised to crack down on unfair trade. Surrounded by executives at a White House conference table, Trump said the U.S. companies had suffered under bad trade policy and unfair foreign competition. TRUMP: They've been horribly treated by other countries, and they have not been properly represented. More importantly, because of that, our workers in our country have not been properly represented. So we're going to build our steel industry back, and we're going to build our aluminum industry back. YDSTIE: Sitting next to the president, David Burritt, CEO of U.S. Steel, said the companies just want a level playing field. DAVID BURRITT: It's for our employees, to support our customers. And when we get this right, it will be great for the United States of America. YDSTIE: But that wasn't the view of investors. The stock market plunged following the announcement with the Dow Jones Industrial losing more than 580 points before recovering somewhat. Chad Bown, an economist and trade specialist, says the tariffs will hurt the U.S. economy. CHAD BOWN: This will drive up the price of steel and aluminum for all of the American consuming industries out there. And there's many, many more companies that need to use steel and aluminum as an input than there are actually, you know, steel and aluminum companies out there - many more workers that work for those using industries. So this is a really big concern just as - from an economic perspective. YDSTIE: The tariffs will be levied under a rarely used section of U.S. trade law following a study by the Commerce Department. The study concluded that steel and aluminum imports have undermined U.S. producers posing a threat to U.S. national security. The finding gives the White House the authority to limit those imports. Bown, who's a fellow at the Peterson Institute for International Economics, says the U.S. already has trade restrictions on Chinese imports of these products, so the new tariffs put in place for national security reasons will largely hurt U.S. allies. BOWN: Europeans, Canada, Mexico, Japan, South Korea - so there's going to be a lot of collateral damage amongst our friends, the countries that are our strategic and military allies, the ones that are apparently going to now be caught up under this national security threat. YDSTIE: Canada is the largest supplier of both products to the U.S. It is responsible for more than half of U.S. aluminum imports and about 17 percent of steel imports. A deep irony, given the national security basis for the tariffs is that under U.S. law, Canada is actually considered a part of the U.S. Defense Industrial Base. Canada's trade minister called the U.S. tariffs unacceptable. China has threatened to retaliate by curbing imports of U.S. soybeans. And the European Union says it's considering action as well. John Ydstie, NPR News, Washington. Transcript provided by NPR, Copyright NPR.